The Z80 used in the Aquarius computer can address up to 64K of memory. This is a mix of ROM and RAM. The figure on the left has been taken from the technical specifications as described by Mattel Electronics and Radofin. On the bottom you can see that the Aquarius is using 8K ROM memory for Basic. Then there is a gap of 4K. This area is reserved for Extended Basic as used in the Aquarius II system, but not used in the standard Aquarius system. The standard Aquarius computer has been sold with 4K of RAM memory, but as you can see in the figure, 2K is already used for video memory (1K screen and 1K color). According to the figure the user has 2K RAM, but actually an additional 256 bytes are being used for system management. That leaves 1,7K free usable RAM on the standard Aquarius and completes the lower 16K memory inside the Aquarius. With the lower 16K occupied the Z80 CPU inside the Aquarius can still address an additional 48K of memory. 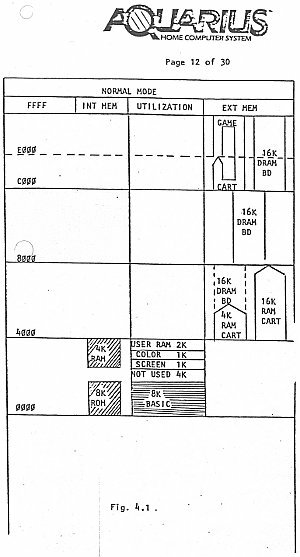 The upper 16K memory part is reserved for cartridges, like games as AD&D, but also Extended Basic and Finform & Fileform. In the figure on the left this memory area is located on the top from C000 - FFFF. Extended Basic and Finform & Fileform also use RAM memory to store their Basic program, letters and spreadsheets. These programs benefit from a large RAM so you can write bigger programs, longer letters and create larger spreadsheets. RAM cartridges were sold seperately, ranging from 4K, 16K and 32K. The biggest cartridge was 32K so it would not not conflict with memory area where the cartridge would be located. This is where the 16K+ memory cartridge step in. These cartridges put RAM on the top 16K of memory, but it can only be used in a standard Aquarius without any additional ROM cartridges. The Aquarius can address up to 64K of memory (RAM/ROM). The maximum available (free) RAM memory, using the standard cartridges, is 33,7K (1,7K standard memory plus 32K memory cartridge). But as Mattel advertised that the Aquarius has 4K RAM then we can safely say that the Aquarius homecomputer can have a whooping 52K RAM.